Today I opened my pantry and was instantly aggravated at the state that it is in and even more aggravated at myself for letting it get so crazy. Seriously…It looks like I am stockpiling for some crazy winter storm where I get trapped in my condo with 11 people that I must feed for at least 4 weeks before we are rescued. It’s bad people, it’s bad. I took all that agro and decided to do something about it. Clean it?? 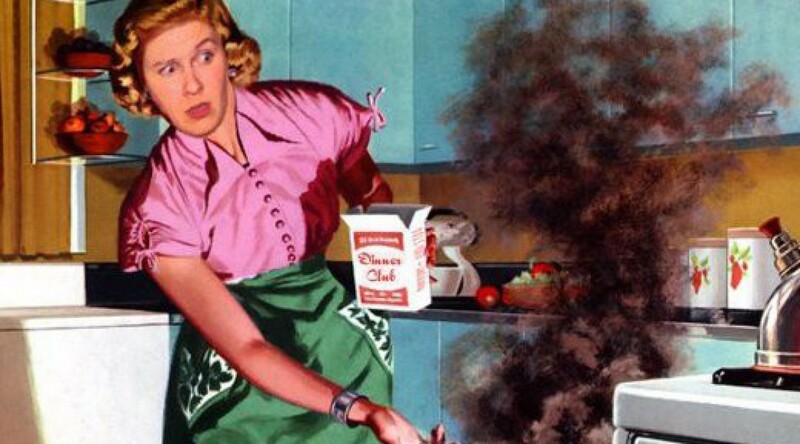 ?…Oh no, that would be crazy because I don’t have enough energy for that at the present time but I did commit to using stuff out of my pantry and trying to clean it out 1 can, one jar, one spice or 1 pack of noodles at a time! That’s right, today I am making a pact to start using what I have in the pantry instead of continuing to buy more and add to the chaos!! After a quick scan and going all entrapment and trying to navigate through the shelves without setting any alarms off, I noticed I had 4 cans of chickpeas. 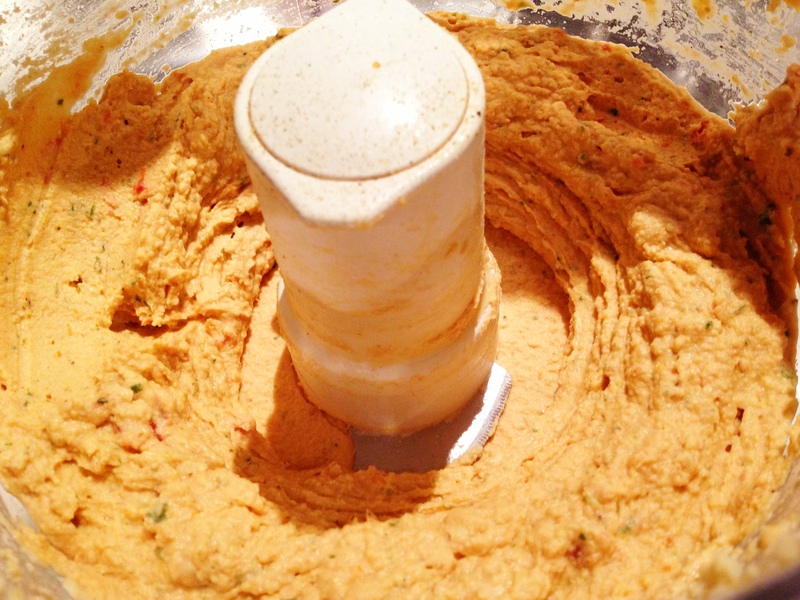 Yup, sealed the deal…I’m making some hummus!! I also noticed a jar of sun dried tomatoes just sitting there…out you come lil guys, we are going to take this hummus from BORING to SOARING in like 2 minutes. 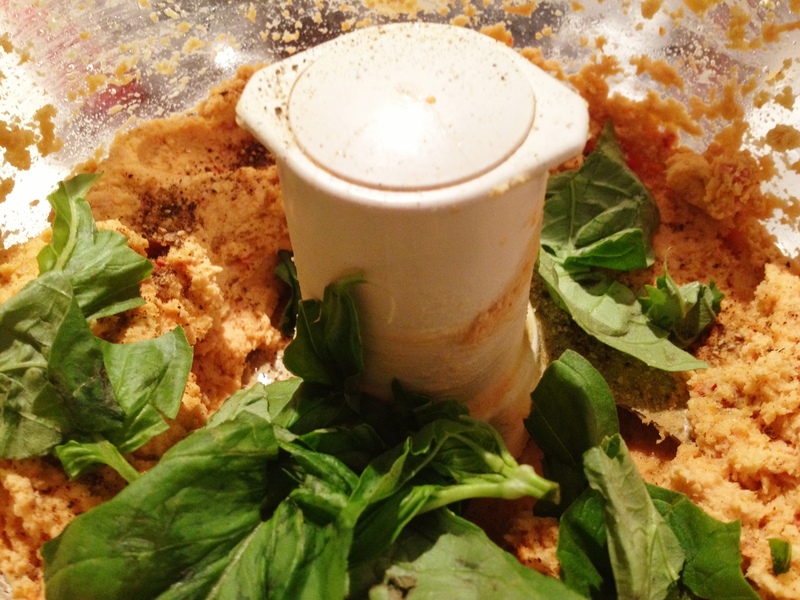 Since I also had some fresh basil on hand, I decided I was going to kick this hummus up and make some sun dried tomato and basil hummus. Oh and since I didn’t put my food processor away yesterday, it was still sitting on my counter so it was only fitting that I use it again right?? 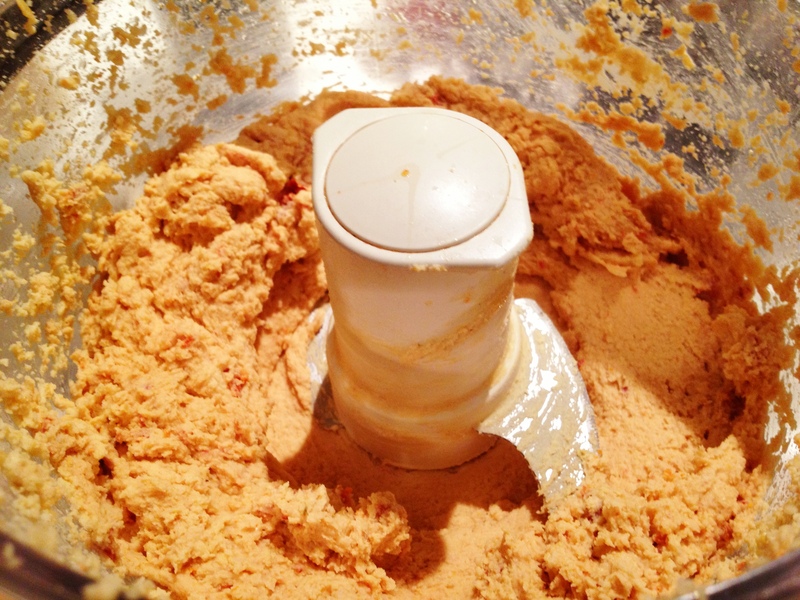 Man, I seriously don’t know what I would do without my trusty Kitchen Aid Food Processor! I’ve had it since before I got married and it’s been used and abused for over 10 years now. This lil gem has been slicing, dicing and mixing its way through multiple kitchens over the years and has really made my life easier on many occasions and for that, I am so grateful for my little buddy. 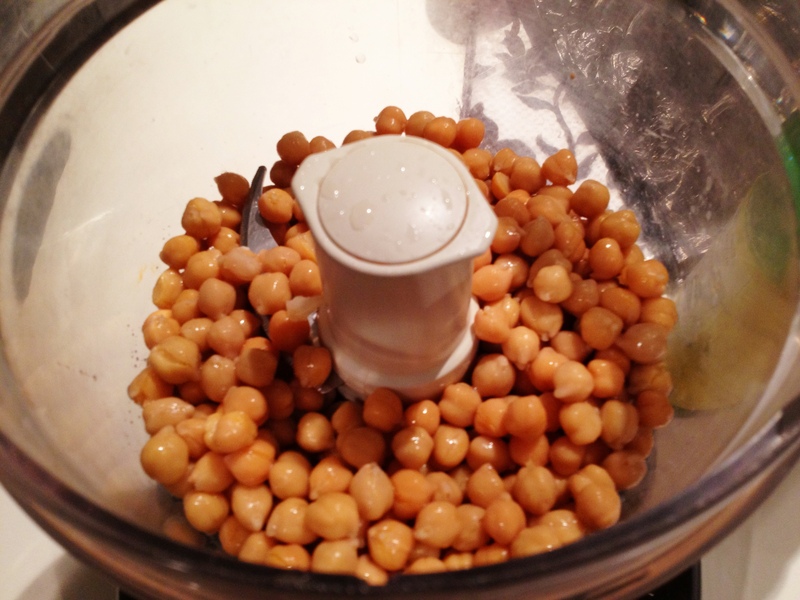 Open up a can of chickpeas, drain them and rinse them until that slimey, gunky stuff washes off. Throw them in the food processor with one clove of garlic. Pulse for a few seconds until the chick peas start to get mashed up. They will normally rise up in the bowl so you will need to stop it and scrape down the sides with a spatula. Next add 3 Tbsp of Lemon Juice and sun-dried tomatoes and tahini (sesame seed paste) and pulse again. It’s pretty thick at this stage so I normally add a drizzle (about 1 Tsp to start) of Extra Virgin Olive Oil to start and then add 3 Tbsp of lemon juice and let the food processor run until everything is processed and smooth. Sorry forgot to take a picture before I add the sun-dried tomatoes but here is what it looks like once they are blended. Still pretty thick so it needs a few more things to make it the right consistency! Next add about 4-5 basil leaves to the mixture and pulse again. If you want, you can also add a bit of salt and pepper. If the mixture is thick, add a bit of water (little bit at a time) to loosen it up a bit. For this recipe I ended up adding about 2 Tbsp total and it was perfect. Still thick but not crazy thick. I don’t like when hummus or dip is too thick and it ends up feeling like you are just eating mashed chickpeas. To me, it’s all about the dip potential…you gotta be able to dip your cracker or veggie in to the mixture and have the dip stick to it but not have your dipping mechanism get stuck in the bowl or break while trying to dip. It’s all about the consistency baby!! Look at this little beauty! Not your average hummus for sure! Just enough garlic, lovely sundried tomatoes and basil that really add a fresh and lovely taste to what used to be boring and average old hummus. 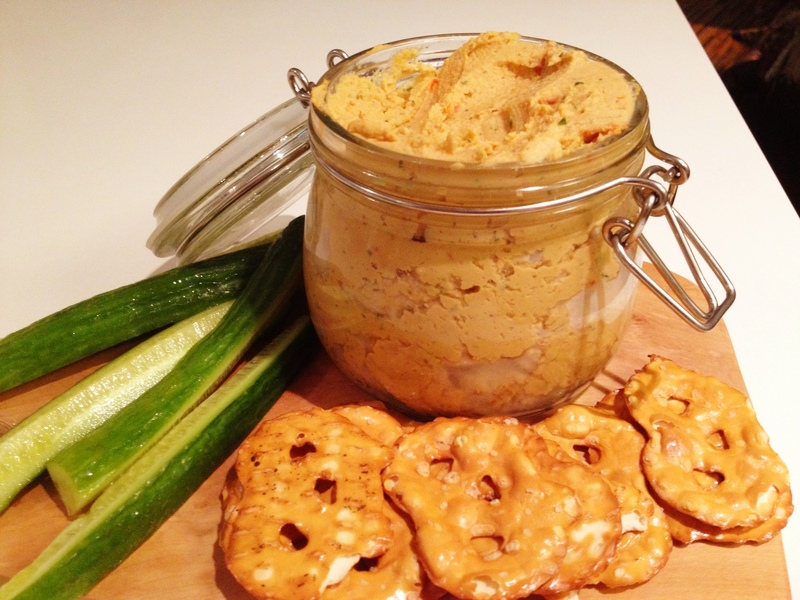 I served this with some pretzel crackers and cucumbers and it was the perfect little snack. I also packed a little roadie for work tomorrow…snacktastic!! Drain and rinse a can of chick peas. 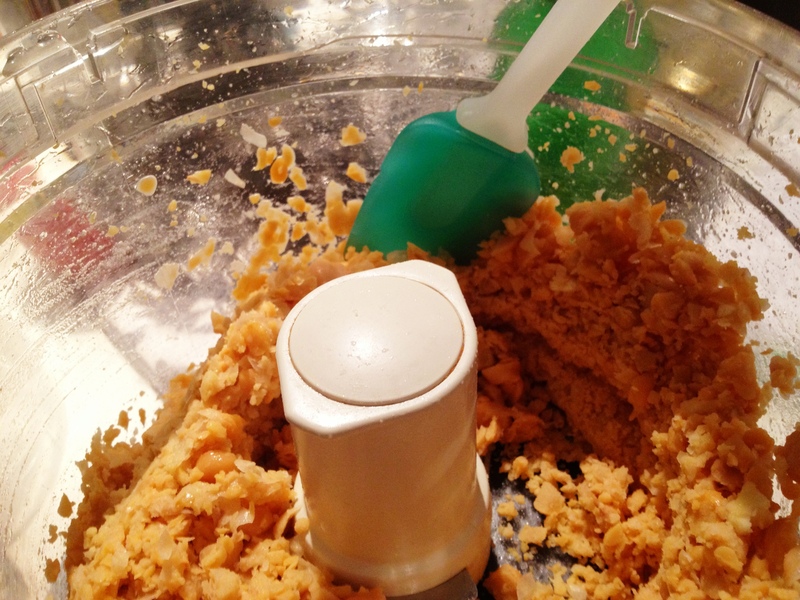 Add chickpeas and garlic clove to food processor and pulse. Add sun-dried tomatoes, lemon juice, tahini and EVOO and pulse until smooth. Add Basil leaves and salt and pepper and then whiz again. If the mixture is thick, add a bit of water (little bit at a time) and then pulse until your desired consistency. Seriously, we are stocked up on hummus for the rest of the week which is a-ok with me!! I can bring this as a snack for work with veggies and/or crackers and it’s perfect. The other great thing about this is that I am one step closer to cleaning out that crazy pantry of mine!! Glad you like it!! It’s pretty tasty and makes a great little snack.